The on-board survey – planned 6 a.m. to 8 p.m. weekdays from Feb. 19 through March 18 – will help establish a baseline of customer satisfaction and ridership patterns on Metro routes in areas around the upcoming Link light rail expansion. A follow-up study is planned later this year to learn how the changes have affected passengers and to learn their opinion of the changes. Survey workers wearing Metro vests will be riding a sample of bus trips during the weekday, handing out and collecting surveys from customers. Surveys will be available in six languages, including Spanish, Chinese, Amharic, Somali and Vietnamese. Routes where riders can expect to see staff include routes 8, 10, 15, 26, 28, 30, 43, 48, 49, 64, 65, 66, 67, 68, 71, 72, 73, 74, 75, 76, 242, 316, 372 and 373. Though the list of routes involved is long, the depth of change planned for the Metro system ended up being less sweeping than many transit advocates hoped for. Responding to complaints, Metro did announce a reroute of the 10 line that will scrap its E Pine and 15th Ave to E John sections and move the route to E Olive Way to better serve Capitol Hill Station. We need your help to save the #43 bus service. If you receive an on-board bus survey in the next few weeks, please fill it out and include your contact information. Metro plans to drastically reduce the number of trips on the route #43 when the UW Link Light Rail station opens in mid-March. 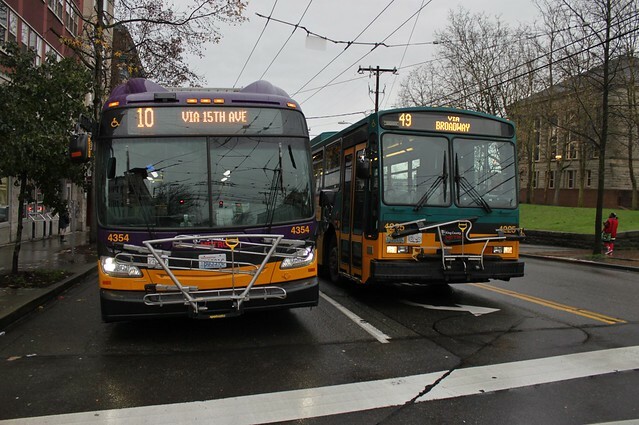 These changes will mean the #43 will only run during rush hour. There will be no service during the day or night. This also means that to get to 15th Avenue E and other stops on the #43 you will have to transfer on East John Street. Prior to when Metro reduces the number of trips on the #43, Metro plans to conduct surveys to determine how happy bus riders are with the changes to the route. The surveys will be conducted for a very short period of time by hardcopy on the buses. The surveys are designed to be completed during your bus trip, but may also be completed online or by request of a stamped envelope from the Metro surveyor. Metro also plans to resurvey bus riders in the fall of 2016 to verify the findings from the first survey. Metro will contact riders for the second survey by the contact information you leave for the first survey. So, it’s really important that you provide future contact information for Metro and that you complete the initial survey. These surveys are the last chance for preservation of trips as well as any future increases in trips after the Link Light Rail station opens. Some residents of Montlake rely upon mid-day trips on the #43 as their preferred mode of travel to points along the #43 route. Some residents do not have alternative transportation modes. Many of these residents find walking to transfer points a hardship. Please be aware of the surveys in the mid-March time frame. And, please complete your survey. Most importantly, please provide your contact information so your voice can be heard again in the fall of 2016. This entry was posted in News, etc. and tagged capitol hill station, light rail, Metro by jseattle. Bookmark the permalink. No one on the 10 was complaining. Metro did not even make any effort to make riders of the 10 aware of the possible changes (other than the sham survey that totally skewed results in favor or rerouting). The demise of the 43 is a big issue for me and I will likely need to drive much more often as a result. The rerouting of the 10 doesn’t really address any bus issues other than trying to route more people to the light rail station. The change to the 10 is only a minor inconvenience but the benefit is dubious.